Being a versatile and highly useful tool, the chainsaw is a tool often used by professionals, homeowners and other occasional chainsaw users who need to cut wood and for various other tasks. However, the chainsaw is also one of the most dangerous tools which can cause serious injury or even death. The chances of chainsaws causing harm significantly increase if they are not well maintained. Ideally, a chainsaw should be cleaned frequently, maybe after every use if possible. Unfortunately, many chainsaw users especially homeowners and other occasional chainsaw users tend to neglect their chainsaws. This is mostly because they only use the chainsaws a few times each year. Cleaning your chainsaw regularly is an important part of maintenance. It will not only keep the chainsaw working in top notch condition but also decrease the possibility of it causing harm or injury while in use. A well maintained chainsaw will last longer and will not need frequent repairs. Remove the fuel filter by pulling it out of the gasoline tank with your fingers and dip it in a strong solvent to dissolve any solid build-ups. Drain all the fuel from the gasoline tank if the chainsaw has not been used in more than two months. After emptying out the tank, clean it with a solvent to remove gasoline varnish and rinse it out using kerosene. You can use solvents such as; toluene, acetone or lacquer thinner. Place your chainsaw upright on a flat surface and remove the spark plug from its socket using a plug spark pull. If there is a lot of dry or brittle black deposits on the spark plug’s electrodes, use a file to remove them before attaching the spark plug back into its socket. If the electrodes are too dirty or damaged, replace the spark plug. Chainsaws need air filters to prevent dust, dirt and all sorts of debris from entering the inner parts of the chainsaw engines. If not cleaned frequently, the air filter may become clogged with all these dirt and particles and when this happens, it may not let enough air in the engine. 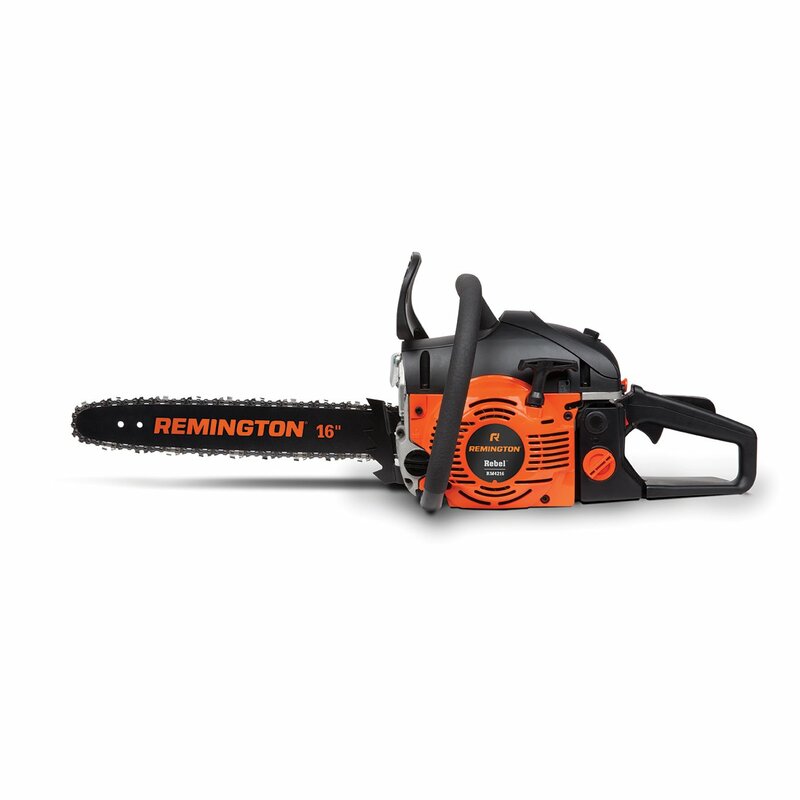 The chainsaw will develop starting trouble’ and if it starts, the engine will still develop decreased power because of the reduced combustion as a result of insufficient air. The engine will also start consuming more fuel as it burns more fuel in order to compensate for the decreased horsepower. To clean it, turn the hold on the air filter cover 90 degrees using your fingers in order to remove the air filter. Wash it with warm soapy water or compressed air. If you use water, make sure that you rinse it and allow it to dry before putting the back on the chainsaw. The spark arrester filter is located behind the muffler and its work is to filter exhaust before it gets to the muffler. If it gets clogged with exhaust fumes, it cannot function well and it may cause the engine to surge or to stall or to overheat. To get to the spark arrester, use a screw driver to loosen the bolts holding the muffler. When it is exposed, spray it with a brake cleaner a few times. If it fails to clean out, pull it out and clear the deposits using a tooth brush before reinstalling it. If it looks too damaged, replace it. The saw chain is responsible for cutting. If it is clogged with sawdust, dirt, debris or grease, it cannot function well and it may even cause accidents. To clean the saw chain, first spray it with a degreaser and let it soak for around 10 minutes. You can also use hot water and soap but it may not get all the grease out. Use a tooth brush to scrub both sides of the chainsaw then rinse with water and use an air gun to ensure that all the moisture gets out. Make sure that the chain is dry before fitting it back on the chainsaw. To clean the guide bar, use warm or hot soapy water and a rug to clean the guide bar and the chain sprocket. Ensure that you remove all debris and dirt that may have gotten inside the guide bar’s grooves. Use a pipe cleaner or a small nail to clean the small oil inlet hole located on the guide bar and the oil way located the engine housing directly above the tensioning bolt. After cleaning the guide bar and the saw chain, fit them back on the chainsaw making sure that the chain is well tensioned and neither too tight nor too loose. Always clean the chainsaw in a clean and safe environment in order to avoid any distractions and also to ensure that nothing gets misplaced during the cleaning. Ensure that every part is dry before putting it back on the chainsaw. Do not clean any petrol powered chainsaw when it is still hot.